I emailed a lot of the guys I know to ask them what their ideal Valentine’s Day gifts would be. After sifting through some of the inappropriate responses (gotta love my boys!) I found a lot of similar requests and the number one request surprised me. 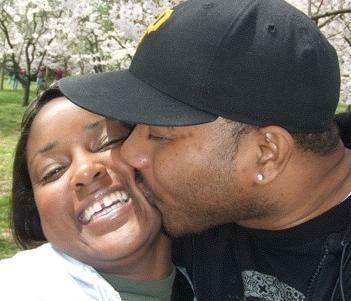 I took the time and I’m giving you a list of five solid things to get the men in your life…let me know what you think and clearly some of my male friends have expensive tastes. 5. Cologne: A lot of them said to get them either something new or a bottle of what they already wear. 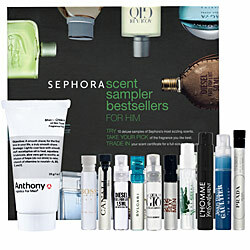 If your man doesn’t have a signature scent or is in the market for something new like my guy, might I suggest the Sephora Scent Sampler Best Sellers for Him. Lots of choices with nice sized samples. 4. Music/Music Related Gifts: I got suggestions on iPods, iTunes gift cards, headphones…clearly the fellas like music. 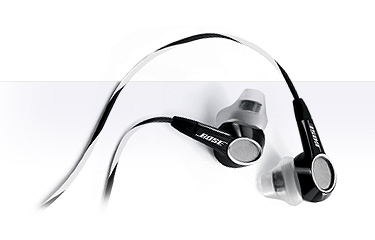 If you’re in the market for a pair of headphones I would definitely suggest the Bose In Ear Headphones. The sound quality is phenomenal, and they’ll think you’re super cool. 2. An expensive accessory they wouldn’t buy for themselves: I got a lot of requests for ties, but high end ties that they wouldn’t normally buy. Or a watch for everyday. One guy wrote, “my girl knows she has better taste than me anyway, I just don’t like to admit that, so I’d wear whatever she gave me.” Check out Nordstrom for a few nice choices in watches and ties. And my number one request…. 1. A MASSAGE! Seriously. Now you can treat your guy to a spa treat like the Bliss Spa Super Blissage treatment where they get a massage and pariffin treatments (my husband thinks pariffin is the coolest thing ever and will agree to any spa service as long as that is included). Or you can get a little sensual at home and use a Lush Massage bar to help rub your partner down yourself.